What these advocates of ‘probity’ forget is that the Corruption Perception Index is just that – a set of ‘perceptions’ with all the in-built biases that the word implies. In fact, the 12 contributing organisations are all based in the US or Western Europe and are strong advocates of free market capitalism. In 2013, Alex Cobham of the Centre for Global Development in Europe, went so far as to suggest that the CP Index embeds a ‘powerful and misleading elite bias’ in popular perceptions of corruption, and should be discontinued. What could be more biased than the fact that many of the highest scorers appear ‘clean’ simply because they have long ago institutionalised and legalised various forms of corruption – like old-fashioned bribery of politicians made kosher by re-naming it as a campaign fund-raiser! Yet, if bribery continues to grow, then there must be someone somewhere profiting from it. At its most basic, a company’s shares are guaranteed to shoot up if it lands a big contract, and as the profit made by its share-holders far exceeds any bribes paid to procure that contract, corruption is justified! Take that to the level of natural resources and infrastructure, and we are really talking big money. It stands to reason that the most laws and regulations in any country always safeguard an activity or commodity that is of greatest significance to that country, right? And the largest bribes would be demanded where the most laws and regulations need to be bent or broken, isn’t it? No wonder Multinationals are willing to pay the most bribes (OECD estimate 21%) for the extractive sectors like oil, gas and mining of coal, rare earths, uranium, gold or diamonds, because that’s where the largest profit margins are. Stands to reason. For global corporates it’s a win-win situation, and only the host country is the loser – its most precious resource is gone forever; the profits have gone to another country; and the taxes thereon to another exchequer. RIP. 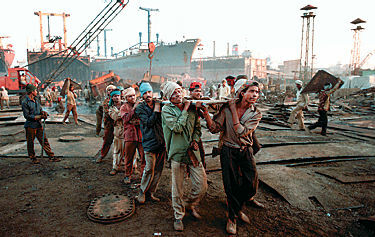 MNCs salve their guilt of profiteering by claiming to create jobs in the host country, but at what cost? The bribe culture lets them get away with paying pitiful wages, running sweatshops, employing child labour, and providing terrible work conditions with minimal regard for worker health and safety. These practices would be unthinkable in the MNC’s home countries, and would probably attract swift legal retribution as well. And to add insult to injury, the same MNCs insist that the country they are stripping of its precious and irreplaceable resources should provide the necessary infrastructure and transport for the commodity extracted. And voila! 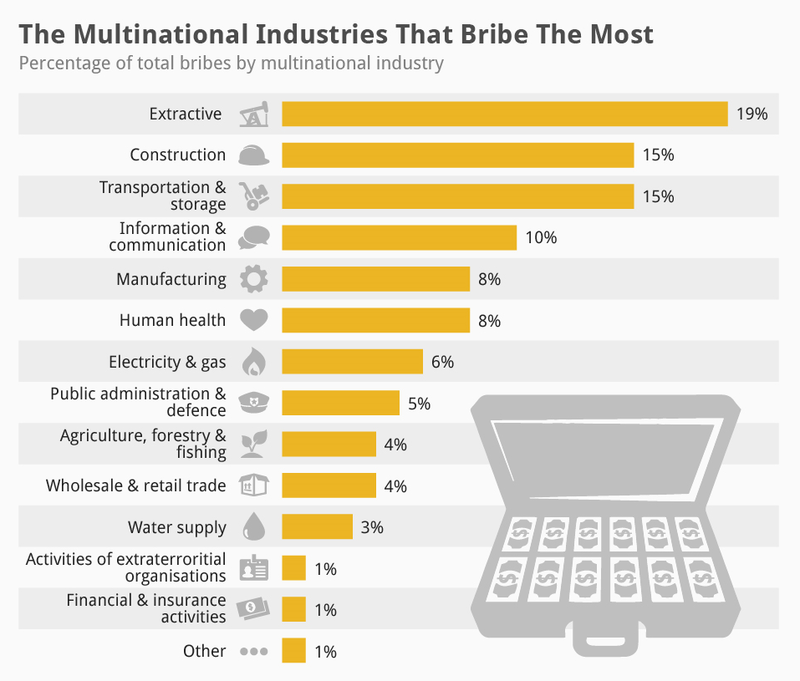 A host of other MNCs step in to provide just that… No wonder construction and transport are the next two sectors in the bribery league table. Furthermore, the development of infrastructure comes with strings attached – the host country is offered soft loans by various international bodies, and it is estimated that for every US$1 borrowed, some African countries have had to pay back as much as US$15! It is this debt repayment which has broken the back of half the countries in that region. And at the end of the day, what are we left with – swinging 6-lane expressways to and from the larger cities, while 90% of the rural population is lucky to be able to afford a bicycle! What intrigued me looking further down the chart, was the inclusion of storage with transportation as a high bribery industry. Until I had a eureka moment. Of course, we are talking about storage and subsequent disposal of e-waste, hazardous materials, radioactive waste, and other nice things. For example, the UN’s Step Initiative says that the global volume of electronic waste is expected to grow by 33% in the next four years, and contains toxic substances such as lead, mercury, cadmium, arsenic and flame retardants. Once in landfill, these toxic materials seep out into the environment, contaminating land, water and the air. In addition, devices are often dismantled in primitive conditions. Those who work at these sites suffer frequent bouts of illness, and long-term diseases. I am sure there are thousands of such ‘honest, concerned and vigilant’ officials all over the developing world – because that’s where Western Europe is increasingly dumping its e-waste and hazardous materials, according to Interpol. “Much is falsely classified as ‘used goods’ although in reality it is non-functional. It is often diverted to the black market and disguised as used goods to avoid the costs associated with legitimate recycling,” said an Interpol spokesman to the Guardian newspaper. “A substantial proportion of e-waste exports go to countries outside Europe, including West African countries. Treatment in these countries usually occurs in the informal sector, causing significant environmental pollution and health risks for local populations,” he said. So that explains the high rates of bribery in the transport and storage sectors. It is nobody’s case that bribery and corruption does not harm a country. It’s just that I would put the onus of this damage more on the greed of the corporates, than on the misguided bribe taker, who is ready to sell out his country and the future of his children. Next Post Shanghai, Hangzhou and Woman Power!